Reject buzzing! Shun lag! Oust muddy frequencies to whence they came! Interested in exploring high-end audio? Buy this card. It's a world apart from its low-end brethren. This isn't just a fancy sound card, you know. Oh no. Let us quote from the included Audio Precision Test Report, a fancy document bound with gold string to compound its obvious legitimacy: "The development of the new Xonar Essence line has triggered us to engage a new quest in search for true high-end audio and the essence of sound." 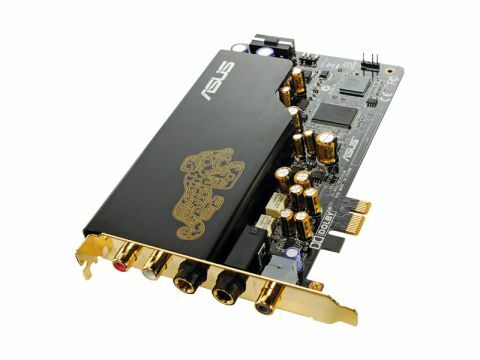 Asus toiled long and hard, and as best we can understand, said essence is a combination of man's desire to search for the perfect sound and good electronic components. So here we are: high-quality capacitors, a PCI-e socket, and a Chinese lion engraved on the heat sink. Lovely. You get a nice fast software driver, which is supposed to give you the best response in games. In practice the difference isn't too great, and the benefits of the Xonar software rarely rise above the pointless; you could play Team Fortress 2 with your audio mashed into some nightmarish satanic warble, but the fact is you won't. Less unnecessary is the dedicated headphone amp, which means a vast sonic range and decent clarity at virtually every level. Although there's not much difference in the high end, bass frequencies seem more brutal, and it's definitely easier to distinguish multiple sounds at once while wearing a decent set of headphones. Another benefit? Fat 6.35mm jack plugs, for proper equipment, and a flexibility in how those ports are used. Plug in a guitar and the line port sets itself up to the correct levels; switch it for a mic or an MP3 player and either will automatically work. You're given separate outputs, red and white RCA connections for speakers and a jack for headphones, because the powerful headphone driver would give your speakers a trashing. Completing the package is a microphone pre-amp, which vastly increases headset clarity, particularly in combination with the main asset of the STX: superlow signal to noise. Asus claims 124dB SNR; we can't argue. The microphone sensitivity really is phenomenal, and there's no detectable buzz in the equation. Whereas we've experimented with USB sound devices and had to post produce to get rid of mountains of static, here we're having to filter out the fan noise from our PC, replicated crisp and clear by a tiny headset mic. Pointing a Shure SM58 away from the noise did the trick; a veritable flat line. if you're considering going anywhere near a podcast, get yourself a decent sound card first. This card is more than worth the £160 of software you'd have to buy to get the same effect.